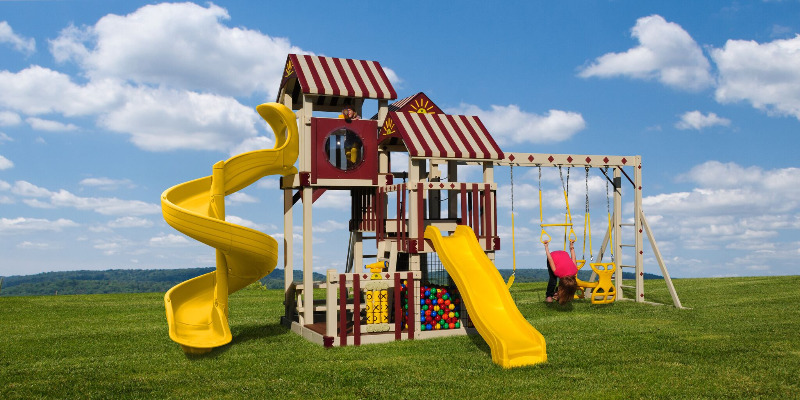 The Shooting StarThis Model Includes: Towers: 8' x 8' Triple Deck Tower. Tower Connectors: N/A. Slides: Turbo Tube Slide, 8' Wave Slide. Climbers: 3' Ladder, 4' Ladder, 5' Rock Climbing Wall/Ladder Combo. Sandbox: 4' x 4' (12 Bags of Sand Needed). Roof Type: Fabric. Swing Bar: 3 Position Monkey Bar. Rides: Belt Swing, Trapeze, Plastic Glider. Fun Add On's: 4' Picnic Table, Tic-Tac-Toe, 2 Telescopes, 1 Periscope, 2 Ship Wheels, Steering Wheel, Bubble Panel, Ball Pit w/ 1500 Playpen Balls.